Lyse cultured mammalian cells with this high-quality, ready-to-use and fully disclosed formulation of a popular cell lysis reagent. 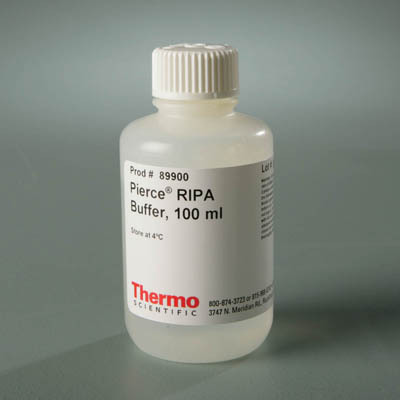 This RIPA buffer effectively lyses and extracts protein from cultured mammalian cells, including plated cells and pelleted suspension cells. The popular reagent enables the extraction of membrane, nuclear and cytoplasmic proteins and is compatible with many applications, including reporter assays, the Thermo Scientific BCA Protein Assay, immunoassays and protein purification. Inhibitors such as Thermo Scientific Halt Protease Inhibitor Cocktail (Part No. 78430) and Halt Phosphatase Inhibitor Cocktail (Part No. 78420) are also compatible with this RIPA buffer formulation and can be added before use to prevent proteolysis and maintain protein phosphorylation.